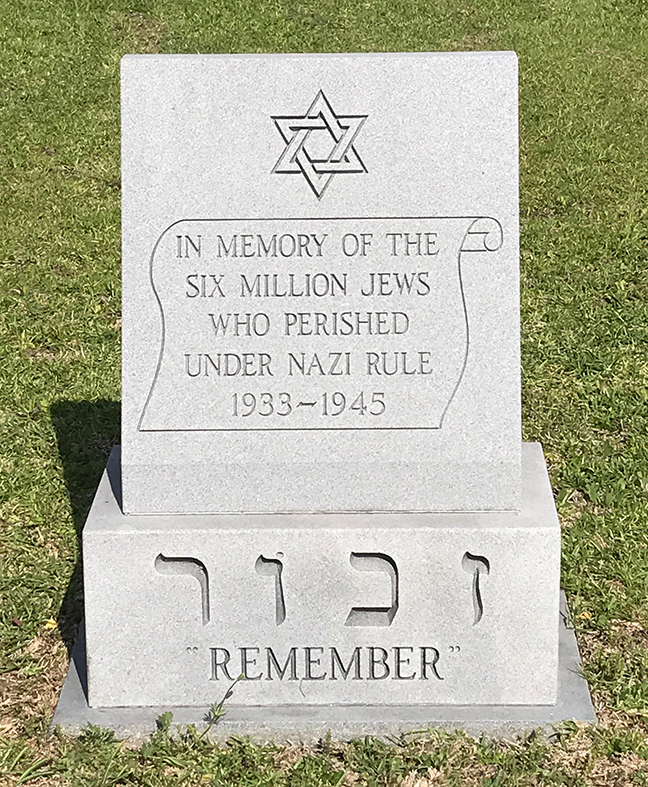 The Holocaust memorial at the B'nai Jeshurun cemetery in Demopolis, Ala. The State of Alabama Yom HaShoah commemoration will be on April 25 at 11 a.m. at the Alabama State Capitol Old House Chamber. Rabbi Lynne Goldsmith of Temple Emanu-El in Dothan will be the keynote speaker. A lunchon will follow, with reservations $18 per person. Alpha Epsilon Pi at Auburn University will have its Walk to Remember on April 24 at Shelby Center Terrace. Participants are asked to wear black. The event will be on April 23 at 2 p.m. at Beth-El. Speakers include Kelly Campbell, The Honorable Debra Goldstein, Eli Pinhas and Dr. Deborah Wiatrak. Each will briefly relate the story of family members who survived the Holocaust. This event will be the first time their family stories are told in public. Rabbis from Temple Emanu-El and Temple Beth-El will participate, along with Cantor Jessica Roskin, Cantor Michael Horwitz, and the Temple Emanu-El Quartet. Music will include traditional Hebrew prayers along with “Hymn of the Partisans,” and “Sorrow/Mariposa,” a song based on a poem by Edna St. Vincent Millay. In conjunction with the Yom HaShoah commemoration, the BHEC is organizing “Unto Every Person There is a Name,” a reading of the names of children who perished in the Holocaust. Schools, churches, businesses, community groups, and synagogues are participating in the city-wide reading. “Darkness Into Life: Alabama Holocaust Survivors Through Photography and Art Exhibit” will be displayed at the Levite Jewish Community Center from April 3 to 24. The educational exhibit features the stories of 20 Alabama Holocaust survivors, teaching the history of the Holocaust and offers a rich understanding of its impact on these individuals and their families. It is coordinated by the Birmingham Holocaust Education Center. On April 24, Birmingham’s LJCC will be part of the Holocaust International Initiative Remembrance Reading honoring Elie Wiesel. The reading will be at noon at the Butterfly Garden. As part of the Birmingham Revealed Cultural Series, Indian Springs School Director of Theater Dane Peterson will star in a new one-man play about the life of Alvin Vogtle, a Birminghamian who escaped from Nazi prison camps five times and later led Alabama Power’s parent company, Southern Company, through some of its greatest financial challenges. The performance will take place at 6 p.m. on April 26, at the Birmingham Botanical Gardens. Dothan’s Temple Emanu-El will host the community Yom HaShoah event on April 23 at 2 p.m., with Rabbi Lynne Goldsmith speaking. A Holocaust art exhibit is also on display at the Troy University at Dothan library. “America’s Story: A Musical Docu-Drama about American Attitudes Toward Nazi Atrocities” will be on April 23 at 2 p.m., at the Huntsville Space Center, Education Resource Center. Sponsored by the Jewish Federation of Huntsville and North Alabama, the event is free and open to the community. The 35th annual Holocaust Remembrance at Jacksonville State University will be on April 13 at 7:30 p.m. at Stone Center Theatre. Second Generation Survivor David Sedlis of Birmingham will be the keynote speaker, relating the story of his father who was in the Vilna Ghetto and later fought with the Partisans. The event is coordinated by Esta Spector and Steve Whitton. On April 20, the University of South Alabama will host “The Amazing Life of Agnes Tennenbaum,” a Holocaust survivor who lived in Mobile until her death in 2015. The 6 p.m. lecture by Patricia Silverman, will be at the Archaeology Museum. The museum is currently featuring the “Darkness Into Life” exhibit. Mobile will hold its annual commemoration at 7 p.m. on April 23, at Ahavas Chesed. The Mobile Christian-Jewish Dialogue organizes the event, which includes students from area middle and high schools sharing poetry and artwork. The interfaith Holocaust memorial service in Montgomery will be April 23 at 3 p.m. at Agudath Israel-Etz Ahayem, featuring Elana Hagler. Tuscaloosa’s Temple Emanu-El will have a Yom HaShoah commemoration on April 23 at 2 p.m., including a remembrance of Elie Wiesel and the reading of the Ten Commandments from the congregation’s Holocaust Torah, a 700-year-old scroll from Czechoslovakia. In Little Rock, the community remembrance will be at B’nai Israel on April 23 at 7 p.m. Lauren Bartshe will give a presentation on the legacy of the Holocaust in Poland. 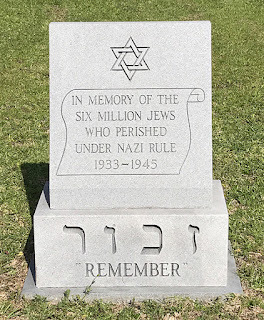 Temple B'nai Israel in Panama City will have a Yom HaShoah Shabbat service on April 21 at 7 p.m., led by Mary and Mike Starkman. There is also a Holocaust remembrance planned for the Naval Support Activity on April 20, with admission restricted due to security. The Panama City congregation will also show the film "Denial" at noon on Saturday, May 13 with a discussion led by Rabbi Alana Wasserman to follow. "Denial" is a 2016 British-American historical drama film based on Deborah Lipstadt's book "History on Trial: My Day in Court with a Holocaust Denier." The event is free and open to the public. The Pensacola community commemoration will be April 23 at 11 a.m. at B’nai Israel. The event will include a performance of “I Never Saw Another Butterfly” by Pensacola High School. The Jewish Federation of Greater Baton Rouge will have its annual memorial program on April 23 at 4 p.m. at B’nai Israel. In addition to the service, there will be a recognition of the Holocaust essay contest winners. As part of “The Power of Children: Making a Difference” exhibit at the Old State Capitol in Baton Rouge, “The Diary of Anne Frank” will be shown on May 3 at 7 p.m. The 1980 adaptation of the stage play stars Melissa Gilbert. Brendan Karch, history professor at Louisiana State University, will lead a discussion after the film. (Note: The date has changed from the earlier announcement of May 2). The screening is part of a three-film series in connection with the exhibit, with Ryan White and Ruby Bridges as the other two featured children. In Lake Charles, the Holocaust remembrance event will be on May 4 at 7 p.m., at McNeese State’s Tritico Theater. Nathan Stoltzfus will speak on the 1943 Rosenstrasse protest in Berlin, where Aryan women married to Jewish men protested the arrest of their husbands, ultimately protecting them. Northshore Jewish Congregation in Mandeville will have a Holocaust remembrance program on April 25 at 6:30 p.m., with guest speakers John Hill Harty of St. Scholastica Academy, and Laura Aysen of Tulane University. B'nai Israel in Monroe will host a short Holocaust memorial service on April 23 at 3 p.m. The New Orleans community event will feature a dialogue between Holocaust survivor Martin Weiss and Sarah Cramson, professor of Jewish studies at Tulane University. Held on April 23 at 6:30 p.m. at the Uptown Jewish Community Center, the memorial program remembers and honors local survivors while educating the public about the Holocaust and teaching the importance of tolerance. During the program, the 12th Annual Educator of the Year award will be presented to Mandeville High School history teachers Christy Nelson and Nichole Sidlovsky for the outstanding work they have done integrating Holocaust education into their curriculum through the creation of a virtual Holocaust museum open to students and the community. The memorial program is free and open to the community. On April 23 at 3 p.m., the Choir of Christ Church Cathedral and the Choir of Isidore Newman School will perform Faure’s “Requiem,” in observance of Yom HaShoah. Rabbi Edward Cohn and Cantor Joel Colman will be featured guests at the performance, which will be at Christ Church Cathedral in New Orleans. Gates of Prayer in Metairie will have a Yom HaShoah observance, led by the religious school students, on April 23 at 11:15 a.m. The interfaith event, which rotates among several Shreveport houses of worship, is chaired this year by Reginald Abrams, general counsel to the Caddo Parish School Board and immediate past president of the Rotary Club of Shreveport. Cantor Neil Schwartz of Agudath Achim will lead musical selections as 11 memorial candles are lit. Awards will be presented for the middle school and high school Holocaust literature contest, which drew over 100 submissions. Red River Radio in the Shreveport area will air “Kaddish,” a program hosted by APM’s Mindy Ratner. The show will be April 24 at 8 p.m.
Beth Israel in Gulfport will have a Yom HaShoah program on April 24 at 6:30 p.m.
Beth Israel in Jackson will have its commemoration at the newly-dedicated Holocaust memorial behind the building, April 23 at 4 p.m. Joseph Metz, grandson of the late Gilbert Metz, will speak. Gilbert Metz’s tattoo number is incorporated into the stained glass panels of the memorial.